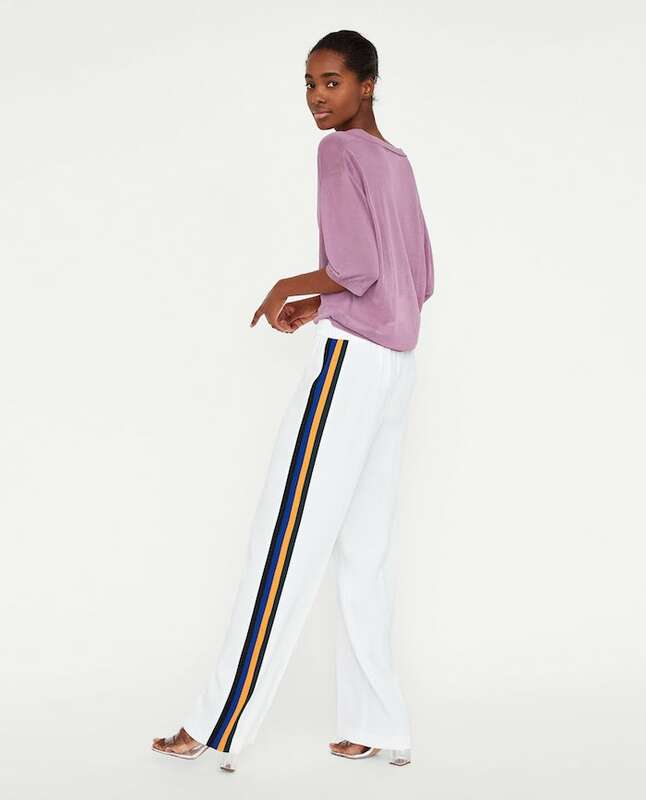 This go-faster stripes on trousers trend is one trend I can get behind, unlike backless things, “cold shoulders” and anything cropped). And it can be almost any sort of stripe; wide bands of colour, thin white piping, even the triple Stripes de Adidas are all the rage again. Because there’s something very flattering about trousers with a sport-luxe detail, isn’t there? Apart from the illusionary leg-lengthening abilities of a side-stripe, the overall cut tends to be a little more relaxed and well-considered; forgiving at the waist, drapey on the leg, fabric that’s soft but not clingy. I was saying I don’t exercise, but I have the healthy, sporty look of someone who does. I’m casual, but I’m polished. See how I’ve nonchalantly thrown on my black leather jacket and huge sunglasses? I’m effortless, me. Or something like that. To be honest, I probably thought none of those things because I’ve never been that worried about trends or edgy kinds of fashion or what other people think about my style – I love what I love, but I’d never wear something to please or impress others. I have to be comfy in it. So, to the point of this post (finally) which is that I have found the absolute Aladdin’s Cave of well-cut side-stripe trouser shops: ME + EM. They also do the softest t-shirts and everything is beautifully made. My favourite pair of side-stripes in terms of striking looks is the Luxe Track Pant (photos above and £149 here*), trousers that have an almost formal cut but are supremely comfortable. My most-worn of the Me + Em trousers from their collection (they very kindly sent these for me to keep) are the Double Stripe Jogger, £79 here*. I cannot rave about these enough. Soft enough to sleep in but smart enough to leave the house in, I’ve been slinging these on with my Prime Knit trainers and a cashmere jumper and feeling ever so pleased with myself. Pulled-together, yet virtually still in pyjamas. Can dressing get better than this? Yes, it seems, especially if you are a fan of the soft waistband. Meet the Side Stripe Palazzo Pant, £79 here*, which takes comfort to a whole new level. If you are newly pregnant, then these are the trousers that will take you through (almost) to the end of your pregnancy and will return, triumphantly, to nurse you – sartorially – through the difficult postpartum phase. The waistband is huge, accommodating, can be folded over or stretched up and is soft against your skin. Which – quite frankly – will probably sound appealing to almost everyone. Which is good, because they’re not actually maternity trousers at all, just the world’s most comfy leisurewear. Sport luxe, I love you. I could really get on board with some jazzy white trousers, if I didn’t live with a dog, cat, toddler and small child who likes paints, but then these at Zara are relatively inexpensive so perhaps a safe-ish buy. They are under thirty quid, so it wouldn’t be catastrophic if they got a few stains on them, which would probably happen within the first eight minutes. I may indulge. Although I am rather partial to the looser white ones here (and above) which have something of a je ne sais quoi Riviera appeal. Gucci meets St Tropez. If that’s even a thing. Crikey, what on earth am I wittering on about? I’m going to try these on later when I’m in London. Which is when I tend to do my “let’s go to sixty shops in the space of three hours” retail therapy marathon. I’m surprisingly speedy. One note, though, on the sport-luxe thing: it does have to look luxe. There are plenty of trousers out there on the market (quite literally) that are made from materials that should never be exposed to a naked flame, that look cheap and shiny and are not by any stretch of the imagination improved by the addition of the side stripe. The side stripe is nothing new (I was rocking it at my local 24 hour garage in my teens as I stood next to my Rover Metro GTi 16V) but the luxe version is a vastly updated and reconsidered version. Thankfully. Choose carefully, get it wrong at your peril.